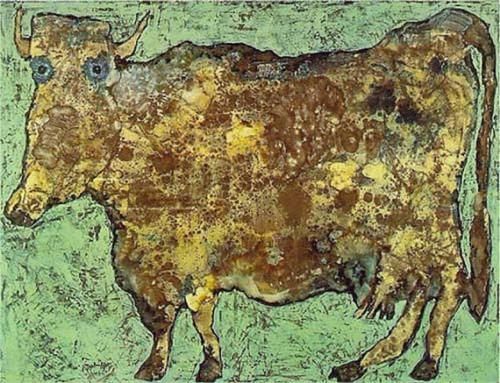 The Cow with the Subtile Nose, by Jean Dubuffet, 1954. ‘. . . According to Reuters, the Gates Foundation will pump $40m into research for higher-yielding dairy cows, as well as chickens that lay better quality eggs, livestock vaccines and “supercrops” that can withstand droughts or disease. ‘These will help farmers in need across the globe—the International Livestock Research Institute says that there are 750 million people in low and middle-income countries who depend on livestock (cattle, sheep and goats) farming, which acts as a source of both nutrition and income. “If you care about the poor, you should care about agriculture. And if you care about agriculture, you care about livestock,” Gates told an audience at the University of Edinburgh on Friday.